I just got back from the Kitchen & Bath show in Chicago, where manufacturers from around the world were showing-off their latest and greatest. Amid the $12,000 soaking tubs and top-grade kitchen appliances being demonstrated by celebrity chefs, I found a little product with a lot of potential—the Tap-On/Tap-Off Water Saving Aerator from Advanta Faucet. The concept behind the aerator is simple. 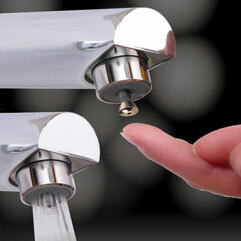 A little button allows you to start and stop the flow of water without touching the faucet handles. Perfect for the kids' bathroom—no more wasted water while they brush their teeth. Would also be great for shaving or for use in the kitchen to avoid contaminating your faucet when handling raw poultry. Best of all, the Advanta Tap-On/Tap-Off Aerators are cheap and easy to install. Just screw-off your existing aerator and screw-in the Tap-On/Tap-Off. The basic model is only $15. The Time Delay model ($18) has an adjustable automatic shut-off that can be set from 2 to 20 seconds. Here's a video I shot at the Kitchen & Bath show of the Tap-On aerator. Sorry about the quality, only had my Blackberry available! These taps do look handy for little ones and for handling raw food especially as it would technically semi-clean itself with the button being in the stream of water. How do I find this product to buy? I tried to track down current info on this device and couldn’t find anything. It looks like the company that made it, Advanta, may no longer be in business. Hi, This is Ramya, I have read the entire information. It’s good, valuable information. I am using the faucet aerators in the kitchen for washing dishes, rinsing vegetables.Before I have used the normal taps but unknowingly I wasted the water a lot. So, please conserve the water by using tap aerators, tap filters.